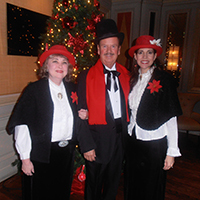 Roll out the Holly…..” because after you hear these carolers you will be in the mood for Holiday Cheer and laughter. Whether performing as a duo, trio, or quartet, this talented ensemble provides quality holiday entertainment for your event with contemporary arrangements of popular carols, as well as traditional favorites. Plus, this group can also provide original Christmas songs that will keep your audience thoroughly entertained.